Tony Blair has pledged to end abuses of the immigration system after an emergency summit in Downing Street. Mr Blair announced an inquiry into asylum statistics to restore public faith and denied claims of a "secret deal" to admit Romanian workers. Meanwhile Home Secretary David Blunkett announced fresh crackdowns on bogus students and sham marriages. But the Tories branded the event a "publicity stunt" and said Labour "had more summits than the Himalayas". The summit, which was attended by senior Cabinet ministers and security chiefs, follows Mr Blair's promise to take a "close interest" in immigration issues after the resignation of Beverley Hughes last week. Are the failings we have heard about in recent weeks the direct result of a deliberate prime ministerial policy to reduce an embarrassing statistic? 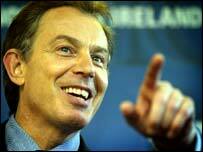 Speaking afterwards, Mr Blair said: "There is no, and should be no, tolerance of abuses." But he also argued that immigration was vital for Britain's economy. Mr Blunkett, who has been under fire for his handling of the events leading up to Ms Hughes' resignation, said: "We are determined to get a grip on the situation. "We appeal to people to have trust in the system because we can't have Fortress Britain. We need people to come here and work." The prime minister's decision to become personally involved, just two months before the European elections, reflects concern within senior government circles at just how politically damaging the issue has become. But shadow home secretary David Davis dismissed the Downing Street event as a "typically cynical gimmick". He said public confidence in the immigration system would not be restored "a series of re-hashed announcements designed to make the prime minister look tough". Deputy Prime Minister John Prescott. He called for a full independent inquiry to find out if the events that led to Ms Hughes' resignation came about "by design or incompetence". "Are the failings we have heard about in recent weeks the direct result of a deliberate prime ministerial policy to reduce an embarrassing statistic, or the inevitable result of a chaotic home office, overseen by an increasingly over-stretched home secretary?," Mr Davis asked. Ministers have been forced to fend off a series of fresh allegations over recent days. An investigation has been launched into the most recent claims that untrained Romanian immigrants have been allowed visas to work as child protection social workers in the UK. Documents revealed the Romanians, who were trained as probation officers, were granted visas to be social workers in Britain, the Evening Standard newspaper claimed. The Department for International Development said it was considering what action to take over the claims.